By 1793, the French Revolution had plunged France into a general European war that would last on and off for more than 20 years and transform Europe. Reading Focus What was the social structure of the old regime? Why did France face economic troubles in 1789? Why did Louis XVI call the Estates General? Why did a Paris crowd storm the Bastille? Taking Notes As you read this section, create a chart to identify causes of the French Revolution. Print out the incomplete chart below as a model. Add more arrows for causes if you need them. Social unrest, economic troubles, and the desire for political reforms led to the French Revolution. Setting the Scene On April 28, 1789, unrest exploded at a Paris wallpaper factory. A rumor had spread that the factory owner was planning to cut wages even though bread prices were soaring. Enraged workers vandalized the owner's home. Later, they stopped some nobles returning from an afternoon at the racetrack. They forced the nobles to shout: “Long live the Third Estate [the common people]!” Riots like these did not worry most nobles. They knew that France faced a severe economic crisis but thought that financial reforms would ease the problem. Then, rioters would be hanged, as they deserved. The nobles were wrong. The crisis went deeper than government finances. Reform would not be enough. By July, the hungry, unemployed, and poorly paid people of Paris had taken up arms. Their actions would push events further and faster than anyone could have foreseen. The Old Regime In 1789, France, like the rest of Europe, still clung to an outdated social system that had emerged in the Middle Ages. Under this ancien regime, or old order, everyone in France belonged to one of three classes: the First Estate, made up of the clergy; the Second Estate, made up of the nobility; or the Third Estate, the vast majority of the population. In the Middle Ages, the Church had exerted great influence throughout Christian Europe. In 1789, the French clergy still enjoyed enormous wealth and privilege. The Church owned about 10 percent of the land, collected tithes, and paid no direct taxes to the state. High Church leaders such as bishops and abbots were usually nobles who lived very well. Parish priests, however, often came from humble origins and might be as poor as their peasant congregations. The First Estate did provide some social services. Nuns, monks, and priests ran schools, hospitals, and orphanages. But during the Enlightenment, philosophes targeted the Church for reform. They criticized the idleness of some clergy, Church interference in politics, and its intolerance of dissent. In response, many clergy condemned the Enlightenment for undermining religion and moral order. The Nobles The Second Estate was the titled nobility of French society. In the Middle Ages, noble knights had defended the land. In the 1600s, Richelieu and Louis XIV had crushed the nobles' military power but given them other rights— under strict royal control. Those rights included top jobs in government, the army, the courts, and the Church. the center of power. Though they owned land, they had little money income. As a result, they felt the pinch of trying to maintain their status in a period of rising prices. Many nobles hated absolutism and resented the royal bureaucracy that employed middle-class men in positions that once had been reserved for the aristocracy. They feared losing their traditional privileges, especially their freedom from paying taxes. The bulk of the Third Estate—9 out of 10 people in France—were rural peasants. Some were prosperous landowners who hired laborers to work for them. Others were tenant farmers or day laborers. The poorest members of the Third Estate were urban workers. They included apprentices, journeymen, and others who worked in industries such as printing or clothmaking. Many women and men earned a meager living as servants, stable hands, porters, construction workers, or street sellers of everything from food to pots and pans. A large number of the urban poor were unemployed. To survive, some turned to begging or crime. Discontent From rich to poor, members of the Third Estate resented the privileges enjoyed by their social “betters.” Wealthy bourgeois families could buy political office and even titles, but the best jobs were still reserved for nobles. Urban workers earned miserable wages. Even the smallest rise in the price of bread, their main food, brought the threat of greater hunger or even starvation. Peasants were burdened by taxes on everything from land to soap to salt. Though they were technically free, many owed fees and services that dated back to medieval times, such as the corvée (kohr vay), which was unpaid labor to repair roads and bridges. Peasants were also incensed when nobles, hurt by rising prices, tried to reimpose old manor dues. Also, only nobles had the right to hunt wild game. Peasants were even forbidden to kill rabbits that ate their crops. In towns and cities, Enlightenment ideas led people to question the inequalities of the old regime. Why, people demanded, should the first two estates have such great privileges at the expense of the majority? It did not meet the test of reason! Throughout France, the Third Estate called for the privileged classes to pay their share. Taken together, the pie graphs below show inequalities among France's three estates.Why did the Third Estate consider the distribution of land unfair? Economic Troubles Economic woes added to the social unrest and heightened tensions. One of the causes of the decline was a mushrooming financial crisis that was due in part to years of deficit spending, that is, a government's spending more money than it takes in. “Bread has again been raised…. The distress of the poor is already very great as may be conceived, and the unusual severity of the weather is at this moment peculiarly unfortunate for them; nor on this account, is it very surprising that robberies should be frequent, which at present is the case in an alarming degree. It is by no means safe to walk the streets late in the evening.” —O. Browning, Dispatches from Paris Primary Sources What were the effects of the rising prices? The Burden of Debt Louis XIV had left France deeply in debt. Wars like the Seven Years' War and the American Revolution strained the treasury even further. Costs generally had risen in the 1700s, and the lavish court soaked up millions. To bridge the gap between income and expenses, the government borrowed more and more money. By 1789, half its tax income went just to pay interest on this enormous debt. To solve the financial crisis, the government would have to increase taxes, reduce expenses, or both. However, the nobles and clergy fiercely resisted any attempt to end their exemption from taxes. Poor Harvests Other economic troubles added to the financial crisis. A general economic decline had begun in the 1770s. Then, in the late 1780s, bad harvests sent food prices soaring and brought hunger to poorer peasants and city dwellers. “Everything conspires to render the present period in France critical: the [lack] of bread is terrible; accounts arrive every moment from the provinces of riots and disturbances, and calling in the military, to preserve the peace of the markets.” —Arthur Young, Travels in France During the Years 1787–1789 Failure of Reform The heirs of Louis XIV were not the right men to solve the economic crisis that afflicted France. Louis XV, who ruled from 1715 to 1774, pursued pleasure before serious business and ran up more debts. His grandson, Louis XVI, was wellmeaning but weak and indecisive. He wisely chose Jacques Necker, a financial wizard, as an adviser. Necker urged the king to reduce extravagant court spending, reform government, and abolish burdensome tariffs on internal trade. When Necker proposed taxing the First and Second estates, however, the nobles and high clergy forced the king to dismiss the would-be reformer. Glorious Revolution in England. They hoped that they could bring the absolute monarch under the control of the nobles and guarantee their own privileges. The cahiers testified to boiling class resentments. One called tax collectors “bloodsuckers of the nation who drink the tears of the unfortunate from goblets of gold.” Another one of the cahiers condemned the courts of nobles as “vampires pumping the last drop of blood” from the people. Another complained that “20 million must live on half the wealth of France while the clergy … devour the other half.” The Tennis Court Oath Delegates to the Estates General from the Third Estate were elected, though only propertied men could vote. Thus, they were mostly lawyers, middle-class officials, and writers. They were familiar with the writings of Voltaire, Rousseau, and other philosophes. They went to Versailles not only to solve the financial crisis but also to insist on reform. around Paris, and rumors spread that the king planned to dissolve the Assembly. Suspicion and rumor continued to poison the atmosphere as the crisis deepened in early July. The king, who had brought back Necker to deal with the financial crisis, again dismissed the popular minister. Food shortages were also getting worse because of the disastrous harvest of 1788. Storming the Bastille On July 14, 1789, Paris seized the spotlight from the National Assembly meeting in Versailles. The streets buzzed with rumors that royal troops were going to occupy the capital. More than 800 Parisians assembled outside the Bastille, a grim medieval fortress used as a prison for political and other prisoners. The crowd was demanding weapons and gunpowder believed to be stored there. The commander of the Bastille refused to open the gates and opened fire on the crowd. In the battle that followed, many people were killed. Finally, the enraged mob broke through the defenses. They killed the commander and five guards and released a handful of prisoners, but found no weapons. When told of the attack, Louis XVI asked, “Is it a revolt?” “No, sire,” replied a noble. “It is a revolution.” The storming of the Bastille quickly became a symbol of the French Revolution. Supporters saw it as a blow to tyranny, a step toward freedom. Today, the French still celebrate July 14 as Bastille Day, the French national holiday. How did popular revolts contribute to the French Revolution? What moderate reforms did the National Assembly enact? How did foreign reaction to the revolution help lead to war? Taking Notes As you read this section, print out and complete this outline. Use Roman numerals for major headings, capital letters for subheadings, and numbers for supporting details. The National Assembly instituted political and social reforms in the moderate first stage of the revolution. Setting the Scene Excitement, wonder, and fear engulfed France as the revolution unfolded at home and spread abroad. Today, historians divide this revolutionary era into four phases. The moderate phase of the National Assembly (1789– 1791) turned France into a constitutional monarchy. Then, a phase (1792– 1793) of escalating violence led to a Reign of Terror (1793–1794). There followed a period of reaction against extremism, known as the Directory (1795–1799). Finally, the Age of Napoleon (1799–1815) consolidated many revolutionary changes. In this section, you will read about the moderate start of the French Revolution. Revolts in Paris and the Provinces The political crisis of 1789 coincided with the worst famine in memory. Starving peasants roamed the countryside or flocked to the towns, where they swelled the ranks of the unemployed. As grain prices soared, even people with jobs had to spend up to 80 percent of their income on bread. In such desperate times, rumors ran wild and set off what was later called the “Great Fear.” Tales of attacks on villages and towns spread panic. Other rumors asserted that government troops were seizing peasant crops. Lafayette, the aristocratic “hero of two worlds” who had fought alongside George Washington in the American Revolution. Lafayette headed the National Guard, a largely middle-class militia organized in response to the arrival of royal troops in Paris. The Guard was the first group to don the tricolor—a red, white, and blue badge which was eventually adopted as the national flag of France. of the French Declaration of the Rights of Man and the Citizen. Thomas Paine was a famous American patriot and writer whose ideas in Common Sense had a great influence A more radical group, the Paris Commune, replaced the royalist on the American Revolution. government of the city. It could mobilize whole neighborhoods for protests During the French or violent action to further the revolution. Newspapers and political clubs— Revolution, Paine moved to France. There, he defended many even more radical than the Commune—blossomed everywhere. the ideals of the revolution Some demanded an end to the monarchy and spread scandalous stories and was elected to serve in about the royal family and members of the court. the revolutionary government. Theme: Political and Social SystemsHow did the American Revolution influence the French Revolution? The Declaration further proclaimed that all male citizens were equal before the law. Every Frenchman had an equal right to hold public office “with no distinction other than that of their virtues and talents.” In addition, the Declaration asserted freedom of religion and called for taxes to be levied according to ability to pay. Its principles were captured in the enduring slogan of the French Revolution, “Liberty, Equality, Fraternity.” Uncertain and hesitant, Louis XVI was slow to accept the reforms of the National Assembly. Parisians grew suspicious as more royal troops arrived. Nobles continued to enjoy gala banquets while people were starving. By autumn, anger again turned to action. On October 5, thousands of women streamed down the road that led from Paris to Versailles. “Bread!” they shouted. They demanded to see the king. As famine gripped Paris, poor mothers did not have enough food for their children. On October 5, 1789, thousands of women decided to bring Louis XVI to Paris, where he could no longer ignore their suffering. Much of the crowd's anger was directed at the queen, Marie Antoinette. Ever since she had married Louis in 1770, she had come under attack for being frivolous and extravagant. She eventually grew more serious and even advised the king to compromise with moderate reformers. Still, she remained a source of scandal. Early in the revolution, the radical press spread the story that she had answered the cries of hungry people for bread by saying, “Let them eat cake.” Though the story was untrue, it helped inflame feelings against the queen. The women refused to leave Versailles until the king met their most important demand—to return to Paris. Not too happily, the king agreed. The next morning, the crowd, with the king in tow, set out for the city. At the head of the procession rode women perched on the barrels of seized cannons. They told bewildered spectators that they were bringing Louis XVI, Marie Antoinette, and their son back to Paris. “Now we won't have to go so far when we want to see our king,” they sang. Crowds along the way cheered the king, who now wore the tricolor. In Paris, the royal family moved into the Tuileries (twee luh reez) palace. For the next three years, Louis was a virtual prisoner. Reaction was swift and angry. Many bishops and priests refused to accept the Civil Constitution. The pope condemned it. Large numbers of French peasants, who were conservative concerning religion, also rejected the changes. When the government punished clergy who refused to support the Civil Constitution, a huge gulf opened between revolutionaries in Paris and the peasantry in the provinces. Constitution of 1791 The National Assembly completed its main task by producing a constitution. The Constitution of 1791 set up a limited monarchy in place of the absolute monarchy that had ruled France for centuries. A new Legislative Assembly had the power to make laws, collect taxes, and decide on issues of war and peace. Lawmakers would be elected by tax-paying male citizens. Still, only about 50,000 men in a population of more than 27 million could qualify as candidates to run for the Assembly. To make government more efficient, the constitution replaced the old provinces with 83 departments of roughly equal size. It abolished the old provincial courts, and it reformed laws. The middle-class framers of the constitution protected private property and supported free trade. They compensated nobles for land seized by the peasants, abolished guilds, and forbade urban workers to organize labor unions. To moderate reformers, the Constitution of 1791 seemed to complete the revolution. Reflecting Enlightenment goals, it ended Church interference in government and ensured equality before the law for all male citizens. At the same time, it put power in the hands of men with the means and leisure to serve in government. The National Assembly produced the Declaration of the Rights of Man and the Citizen, the Civil Constitution of the Clergy, and the Constitution of 1791. These documents brought far-reaching change to France. Which reforms in the chart were due to the Civil Constitution of the Clergy? Meanwhile, Marie Antoinette and others had been urging the king to escape their humiliating situation. Louis finally gave in. One night in June 1791, a coach rolled north from Paris toward the border. Inside sat the king disguised as a servant, the queen dressed as a governess, and the royal children. In Britain, Edmund Burke, who earlier had defended the American Revolution, bitterly condemned revolutionaries in Paris. He predicted all too accurately that the revolution would become more violent. “Plots and assassinations,” he wrote, “will be anticipated by preventive murder and preventive confiscation.” Burke warned: “When ancient opinions and rules of life are taken … we have no compass to govern us.” The failed escape of Louis XVI brought further hostile rumblings from abroad. In August 1791, the king of Prussia and the emperor of Austria—who was Marie Antoinette's brother—issued the Declaration of Pilnitz. In this document, the two monarchs threatened to intervene to protect the French monarchy. The declaration may have been mostly bluff, but revolutionaries in France took the threat seriously and prepared for war. The revolution was about to enter a new, more radical phase of change and conflict. War at Home and Abroad In October 1791, the newly elected Legislative Assembly took office. Faced with crises at home and abroad, it would survive for less than a year. Economic problems fed renewed turmoil. Assignats, the revolutionary currency, dropped in value, which caused prices to rise rapidly. Uncertainty about prices led to hoarding and additional food shortages. Internal Divisions In Paris and other cities, working-class men and women, called sans-culottes *(sanz kyoo lahtz), pushed the revolution into more radical action. By 1791, many sans-culottes demanded a republic, or government ruled not by a monarch, but by elected representatives. Have you ever wondered how political positions came to be described as right or left? Within the Legislative Assembly, several hostile factions competed for power. The sans-culottes found support among radicals in the Legislative Assembly, especially the Jacobins. A revolutionary political club, the Jacobins were mostly middle-class lawyers or intellectuals. They used pamphleteers and sympathetic newspaper editors to advance the republican cause. Opposing the radicals were moderate reformers and political officials who wanted no more reforms at all. It began in France's Legislative Assembly in 1791. Members with similar views always sat together in the meeting hall in Paris. On the right sat those who felt that reform had gone far enough; some even wanted to turn the clock back to 1788. In the center of the hall sat supporters of moderate reform. On the left were the Jacobins and other republicans who wanted to abolish the monarchy and promote radical changes. might far right refer? Far left? Why did radicals abolish the monarchy? How did the excesses of the Convention lead to the Directory? What impact did the revolution have on women and daily life? A radical phase of the revolution led to the monarchy's downfall and a time of violence known as the Reign of Terror. Setting the Scene Someone who had left Paris in 1791 and returned in 1793 could have gotten lost. Almost 4,000 streets had new names. Louis XV Square was renamed the Square of the Revolution. King-of-Sicily Street, named for the brother of Louis XVI, had become the Rights of Man Street. Renaming streets was one way that Jacobins tried to wipe out all traces of the old order. In 1793, the revolution entered a radical phase. For a year, France experienced one of the bloodiest regimes in its long history as determined leaders sought to extend and preserve the revolution. A month later, citizens attacked prisons that held nobles and priests accused of political offenses. These prisoners were killed, along with many ordinary criminals. Historians disagree about the people who carried out the “September massacres.” Some call them bloodthirsty mobs. Others describe them as patriots defending France from its enemies. In fact, most were ordinary citizens fired to fury by real and imagined grievances. The French Republic Backed by Paris crowds, radicals took control of the Assembly. Radicals called for the election of a new legislative body called the National Convention. Suffrage, the right to vote, was to be extended to all male citizens, not just to property owners. In October, Marie Antoinette was also executed. The popular press celebrated her death. The queen, however, showed great dignity as she went to her death. Their son, the uncrowned Louis XVII, died of unknown causes in the dungeons of the revolution. Maximilien Robespierre 1758–1794 Robespierre was the son and grandson of lawyers, but his early life was difficult. His mother died when he was only 6 years old. Just two years later, his father abandoned him and his three siblings. The children were raised by their grandfather and their aunts. selfless dedication to the revolution earned him the nickname “the incorruptible.” The enemies of Robespierre called him a tyrant. Estates General where his career as a revolutionary began. “It is necessary to stifle the domestic and foreign enemies of the Republic or perish with them…. The first maxim of our politics ought to be to lead the people by means of reason and the enemies of the people by terror…. If the basis of popular government in time of peace is virtue, the basis of popular government in time of revolution is both virtue and terror.” —Maximilien Robespierre, quoted in Pageant of Europe (Stearns) Within a year, however, the Reign of Terror consumed its own. Weary of bloodshed and fearing for their own lives, members of the Convention turned on the Committee of Public Safety. On the night of July 27, 1794, Robespierre was arrested. The next day he was executed. After the heads of Robespierre and other radicals fell, executions slowed down dramatically. Theme: Impact of the IndividualHow do you think Robespierre's early life might have influenced his political ideas? the dominant force during this stage of the French Revolution. The Directory held power from 1795 to 1799. Weak but dictatorial, the Directory faced growing discontent. Peace was made with Prussia and Spain, but war with Austria and Great Britain continued. Corrupt leaders lined their own pockets but failed to solve pressing problems. When rising bread prices stirred hungry sans-culottes to riot, the Directory quickly suppressed them. Another threat to the Directory was the revival of royalist feeling. Many émigrés were returning to France, and they were being welcomed by devout Catholics, who resented measures that had been taken against the Church. In the election of 1797, supporters of a constitutional monarchy won the majority of seats in the legislature. As chaos threatened, politicians turned to Napoleon Bonaparte, a popular military hero who had won a series of brilliant victories against the Austrians in Italy. The politicians planned to use him to advance their own goals—a bad miscalculation! Before long, Napoleon would outwit them all to become ruler of France. Women did gain some rights for a time. The government made divorce easier, a move that was aimed at weakening Church authority. Government officials also allowed women to inherit property, hoping to undermine the tradition of nobles leaving large estates to their oldest sons. These reforms and others did not last long after Napoleon gained power. Setbacks As the revolution progressed, women's right to express their views in public came under attack. In 1793, a committee of the National Convention declared that women lacked “the moral and physical strength necessary to practice political rights.” Women's revolutionary clubs were banned and violators were arrested. people of all social classes. Titles were eliminated. Before he was executed, Louis XVI was called Citizen Capet, from the name of the dynasty that had ruled France in the Middle Ages. Elaborate fashions and powdered wigs gave way to the practical clothes and simple haircuts of the sans-culottes. To show their revolutionary spirit, enthusiastic parents gave their children names like Constitution, Republic, or August Tenth. Nationalism Revolution and war gave the French people a strong sense of national identity. In earlier times, people had felt loyalty to local authorities. As monarchs centralized power, loyalty shifted to the king or queen. Now, the government rallied sons and daughters of the revolution to defend the nation itself. spread throughout France. The French people attended civic festivals that celebrated the nation and the revolution. A variety of dances and songs on themes of the revolution became immensely popular. By 1793, France was a nation in arms. From the port city of Marseilles (mahr say), troops marched to a rousing new song. It urged the “children of the fatherland” to march against the “bloody banner of tyranny.” This song, “La Marseillaise” (mahr say ehz), would later become the French national anthem. The second verse and chorus appear at right. “Sacred love of the fatherland Guide and support our vengeful arms. Liberty, beloved liberty, Fight with your defenders; Social Reform Revolutionaries pushed for social reform and religious Fight with your defenders. toleration. They set up state schools to replace religious ones and organized Under our flags, so that systems to help the poor, old soldiers, and war widows. With a major slave victory revolt raging in the colony of St. Domingue (Haiti), the government also Will rush to your manly abolished slavery in their Caribbean colonies. strains; That your dying enemies Should see your triumph and The Convention tried to de-Christianize France. It created a secular, or glory. nonreligious, calendar with 1793 as the Year I of the new era of freedom. It To arms, citizens! banned many religious festivals, replacing them with secular celebrations. Form up your battalions. Huge public ceremonies boosted support for republican and nationalist Let us march, let us march! ideals. That their impure blood Should water our fields.” —“La Marseillaise” Primary Sources Which of the above lines seem most nationalistic? Explain. How did Napoleon rise to power? How were revolutionary reforms changed under Napoleon? How did Napoleon build an empire in Europe? Napoleon rose to power in France and built a vast empire that included much of Europe. Setting the Scene “He was like an expert chess player, with the human race for an opponent, which he proposed to checkmate.” Thus did Madame Germaine de Staël (stahl), a celebrated writer and intellectual, describe Napoleon Bonaparte. Napoleon himself expressed a more humble view of his rise to power. “Nothing has been simpler than my elevation,” he once observed. “It is owing to the peculiarities of the time.” From 1799 to 1815, Napoleon would dominate France and Europe. A hero to some, an evil force to others, he gave his name to the final phase of the revolution—the Age of Napoleon. Early Successes During the turmoil of the revolution, Napoleon rose quickly in the army. In December 1793, he drove British forces out of the French port of Toulon (too lohn). He then went on to win several dazzling victories against the Austrians, capturing most of northern Italy and forcing the Hapsburg emperor to make peace. Hoping to disrupt British trade with India, he led a colorful expedition to Egypt in 1798. The Egyptian campaign proved to be a disaster, but Napoleon managed to hide stories of the worst losses from his admirers in France. Success fueled his ambition. By 1799, he moved from victorious general to political leader. That year, he helped overthrow the weak Directory and set up a three-man governing board known as the Consulate. Another constitution was drawn up, but Napoleon soon took the title First Consul. In 1802, he had himself named consul for life. Two years later, Napoleon had acquired enough power to assume the title Emperor of the French. He invited the pope to preside over his coronation in Paris. During the ceremony, however, Napoleon took the crown from the pope's hands and placed it on his own head. By this action, Napoleon meant to show that he owed his throne to no one but himself. At each step on his rise to power, Napoleon had held a plebiscite (plehb ih sīt), or ballot in which voters say yes or no. Each time, the French strongly supported him. To understand why, we must look at his policies. During the consulate and empire, Napoleon consolidated his power by strengthening the central government. Order, security, and efficiency replaced liberty, equality, and fraternity as the slogans of the new regime. Reforms To restore economic prosperity, Napoleon controlled prices, encouraged new industry, and built roads and canals. To ensure well-trained officials and military officers, he set up a system of public schools under strict government control. At the same time, Napoleon backed off from some of the revolution's social reforms. He made peace with the Catholic Church in the Concordat of 1801. The Concordat kept the Church under state control but recognized religious freedom for Catholics. Revolutionaries who opposed the Church denounced the agreement, but Catholics welcomed it. Napoleon won support across class lines. He encouraged émigrés to return, provided that they took an oath of loyalty. Peasants were relieved when he recognized their right to lands they had bought from the Church and nobles during the revolution. The middle class, who had benefited most from the revolution, approved Napoleon's economic reforms and the restoration of order after years of chaos. Napoleon also made jobs “open to all talent,” a popular policy among those who remembered the old aristocratic monopoly of power. Napoleonic Code Among Napoleon's most lasting reforms was a new law code, popularly called the Napoleonic Code. It embodied Enlightenment principles such as the equality of all citizens before the law, religious toleration, and advancement based on merit. But the Napoleonic Code undid some reforms of the French Revolution. Women, for example, lost most of their newly gained rights and could not exercise the rights of citizenship. Male heads of households regained complete authority over their wives and children. Again, Napoleon valued order and authority over individual rights. example, after unseating the king of Spain, he placed his own brother, Joseph Bonaparte, on the throne. He also forced alliances on European powers from Madrid to Moscow. At various times, the rulers of Austria, Prussia, and Russia reluctantly signed treaties with the “Corsican upstart,” as his enemies called him. In France, Napoleon's successes boosted the spirit of nationalism. Great victory parades filled the streets of Paris with cheering crowds. The people celebrated the glory and grandeur that Napoleon had won for France. France Versus Britain Britain alone remained outside Napoleon's European empire. With only a small army, Britain relied on its sea power to stop Napoleon's drive to rule the continent. In 1805, Napoleon prepared to invade England. But at the Battle of Trafalgar, fought off the southwest coast of Spain, British admiral Horatio Nelson smashed a French fleet. With an invasion ruled out, Napoleon struck at Britain's lifeblood, its commerce. He waged economic warfare through the Continental System, which closed European ports to British goods. Britain responded with its own blockade of European ports. A blockade involves shutting off ports to keep people or supplies from moving in or out. During their long struggle, both Britain and France seized neutral ships suspected of trading with the other side. British attacks on American ships sparked anger in the United States and eventually triggered the War of 1812. In the end, Napoleon's Continental System failed to bring Britain to its knees. Although British exports declined, its powerful navy kept open vital trade routes to the Americas and India. Meanwhile, trade restrictions created a scarcity of goods in Europe, sent prices soaring, and intensified resentment against French power. What challenges threatened Napoleon's empire? What events led to Napoleon's downfall? What were the goals of the Congress of Vienna? Napoleon was finally defeated, but revolutionary ideals and the postwar peace settlement affected Europe for many years. Setting the Scene Napoleon watched the battle for the Russian city of Smolensk from a chair outside his tent. As fires lit up the walled city, he exclaimed: “It's like Vesuvius erupting. Don't you think this is a beautiful sight?” “Horrible, Sire,” replied an aide. “Bah!” snorted Napoleon. “Remember, gentlemen, what a Roman emperor said: ‘The corpse of an enemy always smells sweet.’” In 1812, Napoleon pursued his dream of empire by invading Russia. The campaign began a chain of events that eventually led to his downfall. Napoleon's final defeat brought an end to the era of the French Revolution. Napoleon 1769–1821 Perhaps history has seen no greater believer in nepotism than Napoleon. Nepotism is favoritism shown to relatives by a person in high office. Spanish patriots conducted a campaign of guerrilla warfare, or hit-and-run raids, against the French. (In Spanish, guerrilla means “little war.”) Small bands of guerrillas ambushed French supply trains or troops before melting into the countryside. These attacks kept large numbers of French soldiers tied down in Spain, when Napoleon needed them elsewhere. Eventually, the British sent an army under Arthur Wellesley, later the Duke of Wellington, to help the Spanish fight France. “I am building a family of kings,” Napoleon proudly said. In addition to making his brother Joseph king of Spain, he made Louis king of Holland and Jerome king of Westphalia. His sister Caroline became queen of Naples, and Elisa was named Grand Duchess of War With Austria Spanish resistance encouraged Austria to resume hostilities against the French. In 1805, at the Battle of Austerlitz, Napoleon Tuscany. Then, his mother wanted a title, too! He named had won a crushing victory against an Austro-Russian army of superior her Imperial Highness, Lady, numbers. Now, in 1809, the Austrians sought revenge. But once again, Mother of the Emperor. His Napoleon triumphed—this time at the battle of Wagram. By the peace final family appointment went agreement that followed, Austria surrendered lands populated by more to his son, whom he named than three million subjects. king of Rome. The next year, after divorcing his wife Josephine, Napoleon married the Austrian princess Marie Louise. By marrying the daughter of the Hapsburg emperor, he and his heirs could claim kinship with the royalty of Europe. Defeat in Russia Napoleon's alliance with the Austrian royal family was especially disturbing to Czar Alexander I of Russia. The Russians were also unhappy with the economic effects of Napoleon's Continental System. Yet another cause for concern was that Napoleon had enlarged the Grand Duchy of Warsaw that bordered Russia on the west. These and other issues led the czar to withdraw Russia from the Continental System. Napoleon responded to the czar's action by assembling his Grand Army. Theme: Impact of the IndividualHow do you think nepotism benefited Napoleon? feet wrapped in all sorts of rags…. [We] stared in horror as those skeletons of soldiers went by, their gaunt, gray faces covered with disfiguring beards, without weapons … with lowered heads, eyes on the ground, in absolute silence.” —Memoirs of Philippe Paul de Ségur Only about 10,000 soldiers of the once-proud Grand Army survived. Many died. Others deserted. French general Michel Ney sadly concluded: “General Famine and General Winter, rather than Russian bullets, have conquered the Grand Army.” Napoleon rushed to Paris to raise a new force to defend France. His reputation for success had been shattered. Waterloo—to this day it symbolizes utter defeat. But on the morning of the battle, Napoleon felt certain of victory. “This whole affair will not be more serious than swallowing one's breakfast,” he said. But both weather and terrain conspired against him. First, he held off his attack until the rain-soaked ground could dry. (Cannonballs just stick in mud; they can do more Legacy of Napoleon Napoleon died in 1821, but his legend lived on in damage bouncing along dry France and around the world. His contemporaries as well as historians have long debated his legacy. Was he “the revolution on horseback,” as he ground.) These lost hours gave the enemy time to move claimed? Or was he a traitor to the revolution? in more troops. Second, Napoleon ordered a frontal No one, however, questions Napoleon's impact on France and on Europe. attack against an enemy positioned on an upward The Napoleonic Code consolidated many changes of the revolution. The slope. The crest of its ridge France of Napoleon was a centralized state with a constitution. Elections helped shield the opposition were held with expanded, though limited, suffrage. Many more citizens from French artillery had rights to property and access to education than under the old regime. barrages. At Waterloo, more Still, French citizens lost many rights promised so fervently by republicans than 20,000 French soldiers during the Convention. died, and Napoleon suffered his final defeat. sparked nationalist feeling across Europe. The abolition of the Holy Roman Empire would eventually help in creating a new Germany. Napoleon also had a dramatic impact across the Atlantic. In 1803, his decision to sell France's vast Louisiana Territory to the American government doubled the size of the United States and ushered in an age of American expansion. Theme: Geography and History How did geography help defeat Napoleon at Waterloo? The Congress of Vienna After Waterloo, diplomats and heads of state again sat down at the Congress of Vienna. They faced the monumental task of restoring stability and order in Europe after years of revolution and war. The Congress met for 10 months, from September 1814 to June 1815. It was a brilliant gathering of European leaders. Diplomats and royalty dined and danced, attended concerts and ballets, and enjoyed parties arranged by their host, Emperor Francis I of Austria. While the entertainment kept thousands of minor players busy, the real work fell to Prince Clemens von Metternich of Austria, Czar Alexander I of Russia, and Lord Robert Castlereagh (kas uhl ray) of Britain. Defeated France was represented by Prince Charles Maurice de Talleyrand. The chief goal of the Vienna decision makers was to create a lasting peace by establishing a balance of power and protecting the system of monarchy. Each of the leaders also pursued his own goals. Metternich, the dominant figure at the Congress, wanted to restore the status quo (Latin for “the way things are”) of 1792. Alexander I urged a “holy alliance” of Christian monarchs to suppress future revolutions. Lord Castlereagh was determined to prevent a revival of French military power. The aged diplomat Talleyrand shrewdly played the other leaders against one another to get defeated France accepted as an equal partner. The peacemakers also redrew the map of Europe. To contain French ambitions, they ringed France with strong countries. In the north, they added Belgium and Luxembourg to Holland to create the kingdom of the Netherlands. To prevent French expansion eastward, they gave Prussia lands along the Rhine River. They also allowed Austria to reassert control over northern Italy. This policy of containment proved fairly successful in maintaining the peace. Restoration of Monarchs To turn back the clock to 1792, the architects of the peace promoted the principle of legitimacy, restoring hereditary monarchies that the French Revolution or Napoleon had unseated. Even before the Congress began, they had put Louis XVIII on the French throne. Later, they restored “legitimate” monarchs in Portugal, Spain, and the Italian states. To protect the new order, Austria, Russia, Prussia, and Great Britain extended their wartime alliance into the postwar era. In the Quadruple Alliance, the four nations pledged to act together to maintain the balance of power and to suppress revolutionary uprisings. The Vienna statesmen achieved their immediate goals, but they failed to foresee how powerful new forces such as nationalism would shake the foundations of Europe. They redrew national boundaries without any concern for national cultures. In Germany, they created a loosely organized German Confederation with Austria as its official head. But many Germans who had battled Napoleon were already dreaming of a strong, united German nation. Their dream would not come true for more than 50 years, but the story of German unification began in this period. Prince Clemens von Metternich 1773–1859 As Austria's foreign minister, Metternich used a variety of means to achieve his goals. In 1809, when Napoleon seemed vulnerable, Metternich favored war against France. In 1810, after France had crushed Austria, he supported alliance with France. When the French army was in desperate retreat from Russia, Metternich became the “prime minister of the coalition” that defeated Napoleon. At the Congress of Vienna, Metternich helped create a new European order and made sure that Austria had a key role in it. He would skillfully defend that new order for more than 30 years. Theme: Impact of the IndividualWhy did Metternich's policies toward France change? Looking Ahead Despite clashes and controversies, the Congress created a framework for peace. Its decisions influenced European politics for the next 100 years. Europe would not see war on a Napoleonic scale until 1914. The ideals of the French Revolution were not destroyed at Vienna. In the next decades, the French Revolution would inspire people in Europe and Latin America to seek equality and liberty. The spirit of nationalism ignited by Napoleon also remained a powerful force. 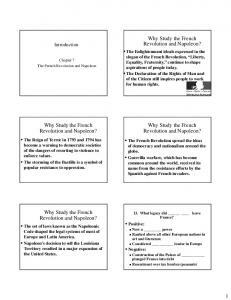 Report "The French Revolution and Napoleon"